There are so many puzzle games on the App Store, that your chances of finding a truly unique one are practically nil. But today is your lucky day. Burglars, Inc., from two-man studio Fuzzy Orbit Games, is a matching puzzler with a difference. The game board is made of tiles with sections of chain on them. You spin these around to make a continuous connection between points at the edge of the board. So far so familiar, but there’s a twist. 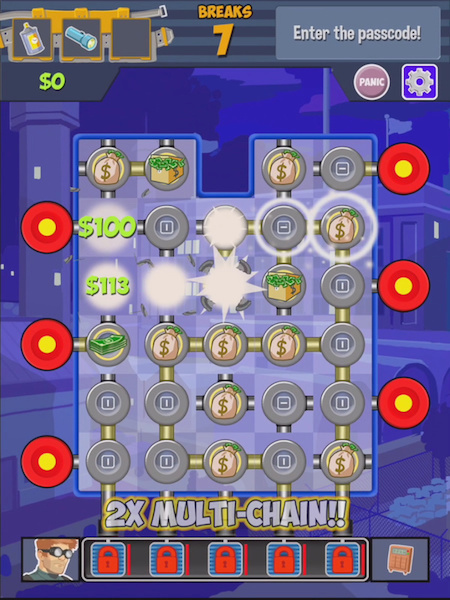 The sections can come together to form branching pathways, and the aim is to use these to collect as much of the loot and other items as you can in each of the game’s nearly 200 levels and eight puzzle types. You play as a band of robbers, employing your unconventional skills to fight back against a corrupt city establishment by stealing as much loot as you can. As you advance through the levels you can buy gear and tools, level-up your rank, and earn badges in an addictive loop of incremental progress. Burglars, Inc. looks like the full package. Not only does it have a unique gameplay mechanic that’s been exhaustively playtested since 2013, but its creators have poured just as much time and effort into the presentation as the gameplay. Sparkly writing, compelling characters and a whole overarching story are sure to add an extra layer of fun to the game. Feel like fighting corruption? You can check Burglars, Inc. out for yourself now by downloading it for free from the App Store. From time to time we will partner with the fine folks at Push Your App on specially commissioned articles. These are NOT paid reviews, but rather informational pieces on subjects and/or apps which we feel will be of interest to our readers. For more information about Push Your App, please visit http://pushyourapp.com/. Push Your App has 35+ years of experience within the mobile industry, offering a variety of services to raise your profile. They can improve the reach of your app, market it and get it noticed by your target audience as well as find a way to retain and monetize your audience.